No. 29, Jalan BP 6/3, Bandar Bukit Puchong, 47100 Puchong, Selangor, Malaysia. 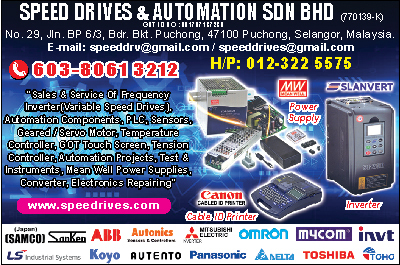 Speed Drive & Automation established in 1999, is one of the leading company that provide Sales & Services of Automation Parts, Frequency Inverter, DC Drives, Control Components, Variable Speed Drives (VSD) Instrumentation, Factory Automation Projects, Custom Build Machine and Engineering services. We're mainly serving the Multi-National Company, Manufacturer, Dealer, Machine Maker and end-user. We do improving and constantly upgrade ourselves in order to compete in today's market. We do provide sales & service in various kind of Automation Parts, Test & Measurements, instruments and other Industrial Components such as Frequency Inverter (Samco, Mitsubishi, Toshiba), Sensors (Sick, Optex, Sunx), Programmable Controller (PLC), Production Counter, Rotary Encoder, Induction Motor, DC Motor & Controller, Geared Motor, Servo and Stepper Motor, Switching and Linear Regulated Power Supply, Temperature and Process Controller, Digital Counter/Timer, Limit Switches, Digital MultiMeter, Clamp Meter, Control System and Automation Projects, Machine Trouble-shooting, Repairing for Industrial Controller, Equipment, Electronics PCB, Instrumentation, Temperature Controllers.